It's almost become traditional to take a cruise from Finland! Whether for sight-seeing, shopping, or just to party, the ferry lines offer a great experience. You can visit St. Petersburg, the Old Town in Tallinn, or cruise the archipelago and see the sights of Stockholm, and since you'll be staying in a nice cabin on board you will probably be spending less than if you'd had to pay for accommodation in Finland! Most of the ferries to Estonia and Sweden are multi-story 'floating palaces' with numerous restaurants, bars, night clubs and shops. They combine the luxury of cruise ships with high-capacity vehicle decks, thereby meeting the needs of passengers who wish to continue their journey by car. The size of the ferries is limited by various narrow passages in the Stockholm, Ålandian and Turku archipelagos, and the Kustaanmiekka strait outside Helsinki, near the island fortress of Suomenlinna. Ships cannot be much longer than 200 metres on these routes. Warning: The buffets are fantastic. You can easily ruin your diet. Tallink & Silja Line and Viking Line compete on the Helsinki-Stockholm and Turku-Stockholm routes, which also call in at Åland. Åland and the surrounding archipelago are a scenic highlight attracting travellers from all over the world, which is no surprise given that Åland has about 6,500 islands! Sunset on a cruise through those surroundings is a special experience. Along with Eckerö Line, Tallink & Silja Line and Viking Line also compete on the Helsinki-Tallinn route. There are numerous crossings per day, some taking just a couple of hours. St. Peter Line operates Helsinki-St. Petersburg services 3 times a week, as well as Helsinki-Stockholm services. Prices for cruises are low; they are essentially subsidized by the on-board tax-free and restaurant sales. A return trip to Tallinn with a cabin for up to four people is often as little as €50. Furthermore, frequent travellers and big shoppers often get gift cards so their next cruise is free! Rantapallo Cruise Listings and Search: Rantapallo lists cruises to favourite destinations from Finland as well as worldwide. The cruise search includes details and offers from all the cruise lines, allowing you to search for the cruise that best suits your schedule and budget 'at one click'. Rantapallo has a strong reputation and is Finland's most-visited travel-focused media, also offering flights, hotels, flight+hotel packages, car hire, and late deals. Site in Finnish but works great translated in Chrome browser! How? Computer: Right-click anywhere on a page and click Translate to [Language]. iPhone / iPad: At bottom of screen, tap Translate. Android: At bottom of screen select Language, tap Translate. Vehicles: On some routes you must have a vehicle, but a bicycle counts! Finland's ferry authority is Finferries, whose motto is What water separates, the ferry connects. However you measure it, Finland has a lot of water 'separating' it! Finland has 187,888 lakes larger than 500m², and 309 lakes or reservoirs larger than 10 km². 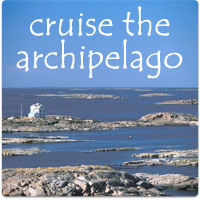 If you are touring Finland - particularly the archipelagos! - you will undoubtedly want the services of a ferry. Finferries' history extends back over 200 years as part of the Finnish Road Administration. From minor, secluded strait crossings to demanding sea passages, Finferries serves passengers on over 40 sea and lake routes throughout Finland, and transports over 5 million vehicles and 10 million passengers per year. The majority of ferry services are conducted by cable ferries, for which a cable is attached from one shore to the other, and the ferry pulled along the cable. Bigger vessels are the freely navigating ferry-boats, the largest of which carries nearly 60 cars. The Helsinki-Suomenlinna ferry is operated by the Helsinki Regional Transport Authority. Regular public transport tickets - city and regional - are valid on Suomenlinna ferries, with numerous Market Square - Suomenlinna - Market Square crossings daily. Besides the usual outlets for buying public transport tickets, Suomenlinna Ferry tickets are available from machines on the piers. Bicycles can be taken on board for an additional charge.